Published: March 25, 2014 at 12:01 p.m. Updated: March 25, 2014 at 12:32 p.m. So what, exactly, is a dynasty? In an NFL sense, we've been taught (or told) that a dynasty puts together a run of multiple Super Bowls in a finite window, with at least two Lombardi Trophies to show for it. Well, after trying to put together a San Francisco 49ers all-time team, it's clear to me that a "dynasty" should really be called "an embarrassment of riches," as San Francisco is so deep at so many different positions. As "Dynasty Month" continues on NFL Network, we have to consider that the Niners just might take the cake. What a group of players below, headlined by two of the greatest Hall of Famers of all. As for the rest of the roster, feel free to share your thoughts ... @HarrisonNFL is the place. Montana is perhaps the greatest quarterback in the history of pro football -- and he's also easily the best in the Super Bowl's nearly 50 years. In four Super Bowl appearances, Montana went 4-0 with three MVPs, 11 touchdowns and zero picks ... oh, and a 127.8 passer rating. "The Jet" was The Man in the 1950s, becoming the first running back to rush for more than 1,000 yards in back-to-back seasons in 1953 and 1954. At the time of his retirement, Perry was the NFL's second all-time leading rusher. Craig's 1985 campaign -- in which he became the first player to have more than 1,000 rushing yards and 1,000 receiving yards in the same season -- is one of the most impressive of all time. And he played mostly fullback. A fine receiver, Craig caught more than 500 passes in San Francisco. Is Rice the best player of all time? That might be up for debate -- at least according to those who fight for Jim Brown -- but no one has been better since the AFL-NFL merger. The current all-time leader in catches (1,549), receiving yards (22,895) and receiving touchdowns (197), Rice was also MVP of Super Bowl XXIII, in which he posted 215 receiving yards. Though he might not be the franchise's premier wideout, Owens did author "The Catch II," caught 20 passes in one game and rang up five 1,000-yard seasons in his eight years with the 49ers. T.O. was also the ultimate mismatch. Davis has been quite the clutch performer in San Francisco. In eight career playoff games, he's posted seven touchdowns while topping 100 receiving yards four times. He has 53 career touchdowns catches, notching 13 in both 2009 and last season. St. Clair was a mountain of a man at 6-foot-9, but also enough of a technician to make five Pro Bowls. It took a heckuva long time for St. Clair, whose stellar 11-year run with the 49ers ended in 1963, to make it into the Pro Football Hall of Fame, but he eventually got the call in 1990. It was difficult to go with Staley over longtime Niners tackle Steve Wallace. Yet, Staley has played at such a high level during this three-year run of NFC Championship Game appearances -- making the Pro Bowl each year -- that he can't be ignored. McIntyre was an elite combination of toughness and finesse, someone who could battle the Jim Burts and Steve McMichaels of the trenches or get out quickly on the sweep. He made five Pro Bowls and won three Super Bowls with the 49ers. Cross is known as a color commentator and as a center to many 49ers fans, but during the prime of his career, he played the guard position as well as anyone this side of John Hannah. Cross made three Pro Bowls as a guard -- and, of course, he collected three big rings over the course of his career. Blue, who anchored the 49ers' line from 1968 to 1974, was one of the best players on the forgotten San Francisco teams of the early '70s that went to back-to-back NFC Championship Games. Blue was named first-team All-Pro twice. North Texas State (now the University of North Texas) must have had one heckuva defensive line in the late 1960s, between Hardman and "Mean" Joe Greene. Hardman played at a high level for a decade in San Francisco, making two Pro Bowls. Smith has been nothing short of a beast since arriving in San Francisco six years ago, making five Pro Bowls in that time while being named All-Pro at two positions in 2011. He has been at the forefront of the 49ers' most recent resurgence. The top 49er of the team's early years, Nomellini and the Steelers' Ernie Stautner were the league's impact players on the interior of the defensive line in the 1950s. Nomellini made the Pro Bowl 10 times and was inducted into the Hall of Fame in 1969. Young was that rare breed of player who spends his entire career with one team. Yes, over the course of his 14-year run, he accumulated the Pro Bowls, the Super Bowl ring and the multiple playoff appearances, but ultimately Young was a true leader for the organization. Finally enshrined in Canton in 2000 -- 26 years after he played his last snap -- Wilcox had long been considered an all-timer by 49ers fans and historians alike. His seven Pro Bowl appearances are a testament to that. Wilcox and Jimmy Johnson were the defensive cornerstones of the Niner teams that made it to the NFC Championship Game in 1970 and '71. Haley did two tours of duty in San Francisco, and his first was the one in which he was stellar. As George Seifert's "elephant" linebacker, Haley was the precursor to the hybrid DE/OLBs of today, racking up 63.5 sacks from 1986 to 1991. I know you're not surprised; what a phenomenal player. Willis has been absolutely dominant since coming into the league in 2007, being named All-Pro or playing in the Pro Bowl every year. He's on pace to surpass 1,000 career tackles in 2014. A lot of fans haven't heard of this Jimmy Johnson, who was a top-flight corner for 16 years. A starter from his rookie year on, Johnson ultimately picked off 47 passes before becoming the second 49er defender to make the Hall of Fame (after Leo Nomellini). They don't make cover corners who are better than Wright. He picked off passes in the 49ers' first two Super Bowl wins (Super Bowls XVI and XIX) and in the 1983 NFC Championship Game, and he also made the game-saving tackle in the 1981 NFC title tilt. At 6-foot-1, he could play today. Maybe the greatest overall player a secondary has ever seen, Lott played at a Pro Bowl level at corner from 1981 to 1985 before becoming the best safety in pro football from 1986 to 1990. A member of the NFL's 75th Anniversary Team, Lott made the Hall of Fame in 2000. Both cerebral and physical, McDonald was one of the first big-name signings at the dawn of free agency in 1993. Eric Davis, his former teammate and my colleague on "NFL AM", called McDonald the "smartest player I played with." 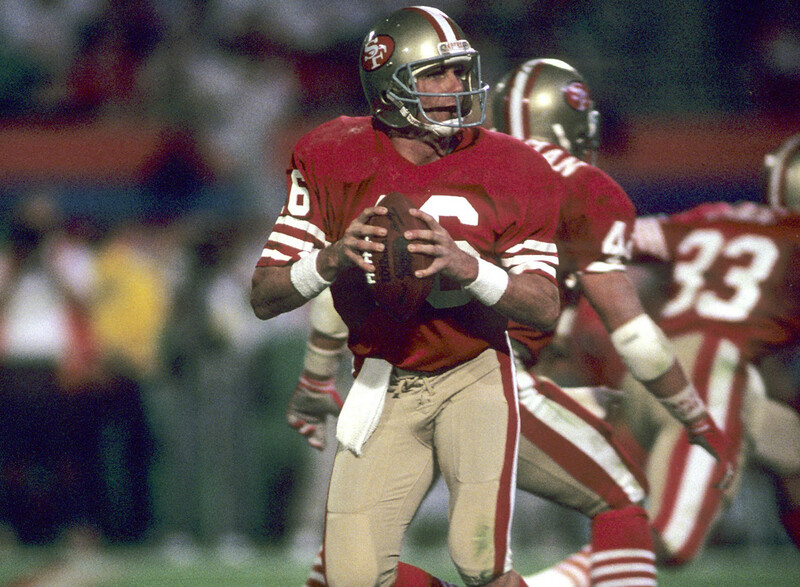 The 49ers' all-time leading kicker sported an old-school helmet and mustache until the end of his career in 1987. He also scored 979 points and won two Super Bowls with the franchise. Through 10 years of punting in San Francisco, Lee has established himself as one of the best punters in NFL history. He currently ranks fourth all-time in yards per punt at 46.1 and has been named first-team All-Pro three times. It's embarrassing that Woodson's name didn't immediately come to mind when I was compiling this list. He made the Pro Bowl five times in seven years with the 49ers, pacing the NFL in yards per kick return three times en route to a 28.7 career average.